This post brought to you by Dropcam. All opinions are 100% our own. A new way of video monitoring has dropped into the picture. Dropcam is a Wi-fi video-based home monitor system that provides live streaming and communication options that are easy to install and use. The basic components of a Dropcam system include one or more cameras and any laptop or wireless device to control the cameras and view video footage. As I reviewed what dropcam.com offers, I was impressed by the capabilities, intrigued by the possibilities, but discouraged by the practicalities. Ability to share video footage with family and friends, or stream live to the public and world wide web! With so many capabilities, the list of possible uses is long! Dropcam.com highlights four main ways that a dropcam system could function for people: home security, baby monitoring, pets, and business. A father out of town could peak in and “hang out” with the family at any time, a well-placed camera could guard personal belongings, or an unsolved pet mystery could be solved with the correct set-up. This could be great for a small business owner looking to set up surveillance but not pay a huge monthly bill for a security system. It’s even fun to see live demos on the website of how other people are using a dropcam system to their advantage. While dropcam provides tons of cool features, I think the avenues for practical personal use are narrow. 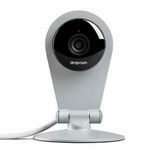 Dropcam cameras currently cost $199 or $149, depending on the model. Live streaming is free, but continuous video recording is a monthly charge ($10-25 per month) depending if the customer wants video recorded for the past week or month. The price of more traditional security systems vary a great deal depending on the complexity and features, so it is hard to compare prices. It is safe to say though, that one would take on an installation fee, a significant monthly monitoring price, and lengthy contract but also receive more customer service help with a traditional security system set-up. For myself, I scanned around my house to see if setting up a dropcam system would be practical. If a baby were on the way (no, this is not an announcement), I’d consider the dropcam for a baby room, but would question the mobility of the device when we were staying at another house. I’d be nice (or creepy?) when I was away to have a dropcam in the kitchen or living room to drop in and say hi to my wife. Depending on the safety of our neighborhood, I’d consider placing one outside too. This system would be cool but cost some cool cash too. For some, I think dropcam could provide a wicked-cool gadget and maybe some peace of mind to see two places at once. For me, I would first evaluate my true needs and see if Dropcam fits the niche (and budget) of what I’m looking for. Ooma Premier Review 2014 – Is It Worth It? Another cost to consider, with the traditional security system service (like ADT) you may have to get a city permit. Recently, people in my area were surprised of the additional cost to install their systems. They weren’t informed when purchasing it.